The Ares blade lives up to its namesake Greek god's name, the god of war. This knife is manufactured for military fighting or utility knife. 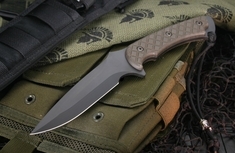 With the help of U.S. Special Operations Forces, this knife was developed with the modern warrior in mind, with special attention paid to the needs of serious military professionals. The Ares, made by Spartan Blades, is an excellent combat and utility knife. With a blade length of 5 3/8" and a composition of CPM S35VN steel, if you are a military professional, or just want a knife designed for one, this is the knife of choice. As an Authorized dealer, all of our Spartan Blades are sold with a satisfaction guarantee and fast same business day shipping.